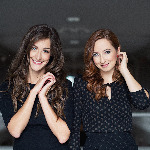 Made up of pianists Amélie Fortin and Marie-Christine Poirier, Duo Fortin-Poirier have distinguished themselves with fiery four-hand interpretations, remarkable for their vitality and wit. A close affinity between their playing styles along with a sharp, shared sensitivity fuel their extraordinary ensemble playing. DUO FORTIN-POIRIER Made up of pianistsAmélieFortin and Marie-Christine Poirier, Duo Fortin-Poirier have distinguished themselves withfiery four-hand interpretations, remarkable for their vitality and wit. A close affinity between their playing styles along with a sharp, shared sensitivity fuel their extraordinary ensemble playing.